Thousands of anti-government protesters have descended on Tbilisi for a third day in a row. Police tried to disperse the demonstrations with tear gas and rubber bullets. Russia has slammed the clampdown calling it a direct violation of human rights. ­The opposition has spent an hour-long emergency meeting on further actions and has agreed to continue the protest outside the Public Television building in Tbilisi. "We have decided to stay one more day outside the Public Television building and to conduct a rally at 3pm on Monday. Protestors who are tired will be replaced by opposition activists who have rested," Interfax news agency quotes ex-speaker of the Georgian parliament Nino Burdzhanadze as saying at the rally. According to Burdzhanadze, a former associate of President Mikhail Saakashvili who supported his coming to power during the regime-changing "Rose Revolution" in November 2003, protesters will remain until the president steps down. Opposition leaders are calling it a revolution, provoked by the government, which they claim will oust the incumbent President Saakashvili peacefully by Wednesday. “A revolution is already going on. And it is not up to us – the government began the revolution, when government began to terrorize people, when the government arrested hundreds of absolutely innocent people, when the government very seriously beat lots of people, when they confiscated property of the citizens and at last cracked down four times on peaceful manifestations. 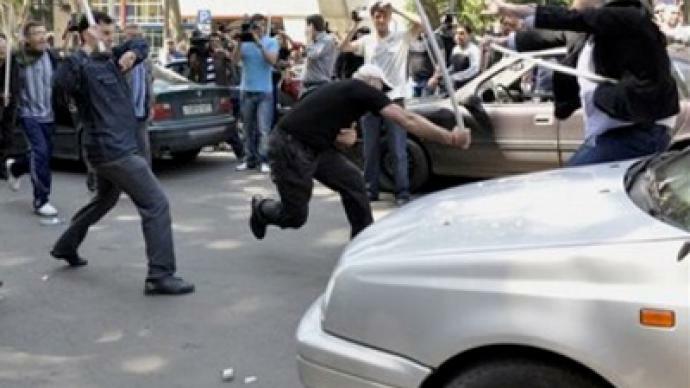 I would like to remind that these manifestations were sanctioned by the side of government,” said Burdzhanadze. As Burdzhanadze reported on Sunday morning, about 300 people have been detained by police, though Georgia’s Interior ministry insisted only 11 were arrested. Nino Burdzhanadze is going to call on embassies of United States, Great Britain, Germany and France to send their representatives to observe the protests, Itar-Tass news agency reports. She has assured that she will personally inform foreign diplomats that the protest is legal, peaceful and sanctioned by the authorities. There has been no any official reaction from the government yet. President Saakashvili is reported to have left the country on a visit to Hungary. Mass protests started in Georgia on Saturday when some 5,000 people gathered in the center of Tbilisi demanding President Saakashvili resign in order to conduct early parliamentary and presidential elections. 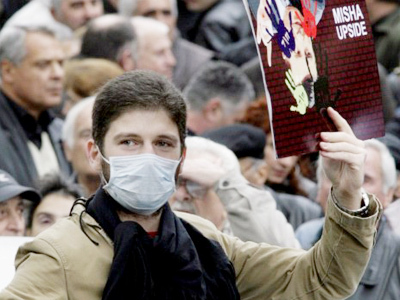 On Sunday the protest continued, with about 2,000 people coming to the Public Television building in Tbilisi. Georgian police used rubber bullets and tear gas to disperse a protest rally near the office of the country’s public broadcaster. The Russian Foreign Ministry has urged Georgian authorities to stick to their obligations to defend human rights and called the dispersal of the rallies in Tbilisi and Batumi an evident violation of the basic human rights and freedoms. “Such actions by the Saakashvili regime cannot be regarded anything else but a hurdle for the Georgian population and the country’s political forces to execute their legal rights for a freedom of meetings and a freedom of opinions stipulated in the European Convention for the Protection of Human Rights and Fundamental Freedoms” said Russian Foreign Ministry representative Konstantin Dolgov in a statement released on Monday. 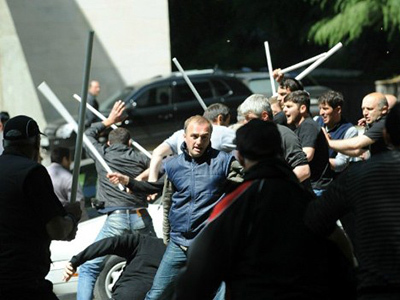 “If the Georgian authorities do not stop their forceful methods it could lead to further aggravation of the relationship between the authorities and the opposition and further destabilization of the situation in the country,” says the statement. The opposition claims the current regime has taken away people's democratic freedoms and President Mikhail Saakashvili’s continued presence at the top puts the whole region at risk. This is not the first time dissatisfied Georgians have protested against the government. Opposition forces in Georgia criticize Saakashvili for not following his economic and political promises. They consider the situation with human rights to be a major concern. Political analyst, Irina Kobrinskaya, believes that despite many failed rallies in the past, this time there’s a good chance that the opposition may succeed in forcing Mikhail Saakashvili from power. “In fact, President Saakashvili is not a political personality, who can easily step down. The history of his presidency shows that he’s not going to do it easily. But this time, really, the scale of the protest may go far and wide. We have to just wait and see what the reaction will be to this protest in the country. If the protest is really high and if the opposition is consolidated enough maybe he’ll have no other alternative and he’ll step down,” she said.